Mr. Wolf’s Class: Book #1 The First Day of School by Aron Nels Steinke is not your mother’s back-to-school middle grade chapter book. It’s a smart, funny, insightful look at fourth-grade in graphic novel format and I enjoyed every page. From the realistic, contemporary dialogue to the perfectly captured facial expressions on the diverse line up of teachers and students, Steinke succeeds in helping readers connect with and care about an assorted and appealing cast of characters. And that’s a good thing since this is Book #1 in a new series that is sure to captivate even the most reluctant kid. In this first book, we’re introduced to Mr. Wolf, a new teacher at Hazelwood Elementary. 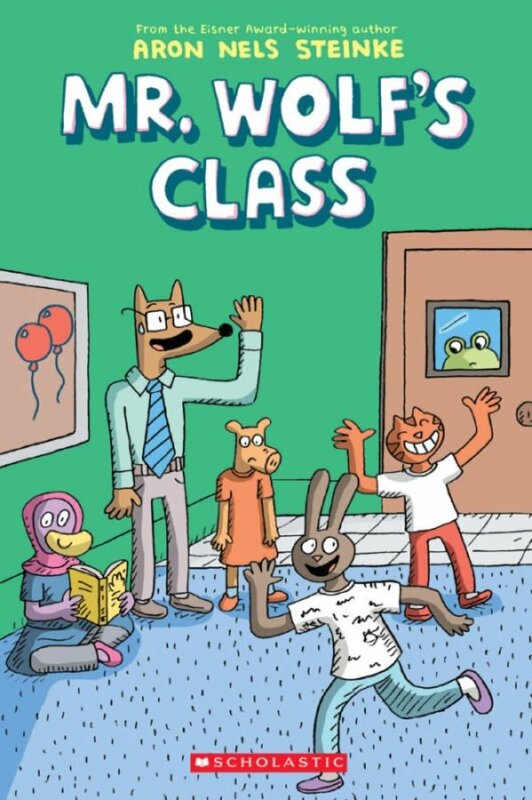 In fact, even before Chapter One (there are eleven chapters in total), anthropomorphic artwork full of color and movement shows Mr. Wolf conscientiously preparing his classroom followed by frames of each student, with illustration clues, as a quick and clever way to hint at their personality or issue. There’s new-in-town student, Margot, eager to start school but nervous about making friends; there’s Penny, poor, wiped out Penny, whose constantly crying baby sibling is keeping her from getting a good night’s sleep; there’s Aziza, a dedicated student but slightly snarky; and there’s Sampson, who’s brought something special to school to share at show-and-tell. As an elementary school teacher and parent, Steinke totally gets this age group and the ever-changing dynamic of the classroom. One minute there’s silent reading and the next there’s chaos. All types of conflicts caused by all kinds of kids can occur throughout the day and Steinke’s chosen a few good ones to portray in Mr. Wolf’s Class. He’s included geeks and smart alecks, thoughtful and mean kids. He’s also got bossy and meek ones, tattle tales and show offs. With that kind of composition, anything can and does happen under Mr. Wolf’s supervision including a missing student, show-and-tell, and a burgeoning friendship. I’d like to emphasize here that this book can be appreciated year round for its wit, its engaging illustrations and the delightful depiction of fourth-grade from multiple perspectives. Join Mr. Wolf and his students to see first-hand what’s happening at Hazelwood Elementary. 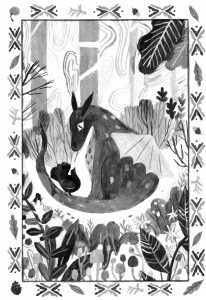 Interior art from The Language of Spells written by Garret Weyr with illustrations by Katie Harnett, Chronicle Books ©2018. All dragons were summoned to Vienna and, due to the inconvenience of their existence, most mysteriously disappeared. While the Department of Extinct Exotics controls the gold-eyed dragons who were allowed to remain, Grisha struggles to remember what happened to the others. Maggie’s determination to help sets them on an investigative journey. Though they know using magic requires a sacrifice, Maggie and Grisha travel across Europe to fight injustice and face difficult decisions. 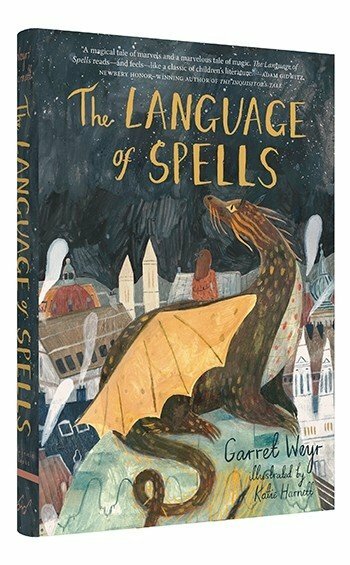 The Language of Spells is a different sort of dragon tale—one worth a deliberate read and thoughtful introspection. 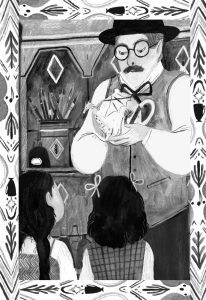 Each chapter opens with a charming illustration by Katie Harnett. The uplifting scenes enhance the story’s relationships. Weyr’s slow-building, sometimes funny tale has an old-fashioned lyrical feel. The book raises questions about the cost of power, the bonds of families and friendships. When few can see the magic left in the world, does it still exist? Until now, Stacy McAnulty has been best known for her picture books. (EXCELLENT ED is one of my favorites.) 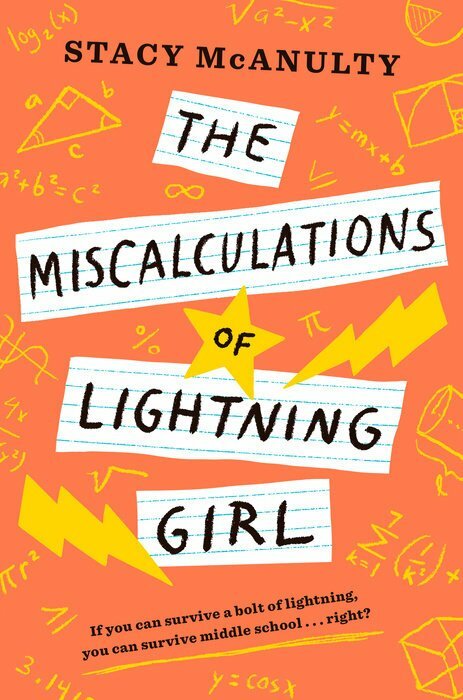 But her middle grade debut, THE MISCALCULATIONS OF LIGHTNING GIRL, puts her squarely in the category of must-read middle grade author, as well. 12-year-old Lucy Callahan narrates the book. Thanks to a chance meeting with a bolt of lightning, Lucy is a math genius. She’s been homeschooled for the four years since the accident and, technically, she should be going to college. Lucy’s grandma just has one requirement before sending her young charge off to university: “Go to middle school for 1 year. Make 1 friend. Join 1 activity. And read 1 book (that’s not a math textbook! ).” The mysteries of calculus, algebra, and geometry are easy for Lucy to solve. But the mystery of how to survive middle school? It’s an impossible equation—especially for Lucy. Lucy’s not very good at making friends. And, though she’d prefer to blend into the background, a case of obsessive-compulsive disorder (another result of the lightning strike) makes her stand out. For example, she can’t just sit down. She needs to sit, stand, sit, stand, sit (otherwise she incessantly recites the numbers of pi in her head). And a germ phobia means she goes through a good number of Clorox wipes during the school day. (Lucy would want me to give you an exact here, but I can’t.) However, in spite of this, Lucy is comfortable with herself and I love that. In fact, McAnulty never gives the impression that the things that make Lucy so unique (and make middle school so difficult for her) are problems to be solved. They’re just part of Lucy—for better or worse. There are other problems too. Lucy’s mom is dead; her dad is absent; and her grandmother struggles to make ends meet. But these are all just part of Lucy’s life. McAnulty doesn’t let them become the focus of the book, which is just as it should be. I don’t want to ruin the fun of reading this book by giving too much away. I will just say that I thoroughly enjoyed experiencing the world through Lucy’s eyes. You don’t need to love (or even understand) math to love THE MISCALCULATIONS OF LIGHTNING GIRL. It’s a book for anyone who has ever felt out of place, vulnerable, or just plain weird. And I’m pretty sure that’s all of us. ★Starred reviews from Kirkus Reviews, Publisher’s Weekly, and School Library Journal. Read another review by Colleen Paeff here. is reviewed by Colleen Paeff. Open if You Dare by Dana Middleton begins at the end. It’s the last day of elementary school and three best friends Birdie, Rose, and Ally are about to embark on their very last summer together. Rose is moving back to England in August and Ally and Birdie will attend different middle schools come September. Nothing will ever be the same again and the girls know it. They are looking forward to a blissfully predictable summer of swimming, softball, selfies, and lots of time together on their secret island. But the discovery of a mysterious box and its sinister contents takes the trio on an unexpected search for the identity of a dead girl and the villain who killed her. Middleton expertly weaves mystery with coming-of-age, as the girls experience crushes and rivalries, bad decisions and harsh consequences, parental expectations and annoying siblings – in other words, Life – in the midst of their search for answers. When the clues run dry, Rose and Ally would happily give up the hunt in favor of milking as much fun as possible out of their last summer together, but Birdie, our narrator, can’t let it go. Perhaps it’s because, for her, solving the mystery of the dead girl seems easier than solving the mystery of what life will be like without Rose and Ally by her side. Like any good mystery, there are twists and turns and startling connections. 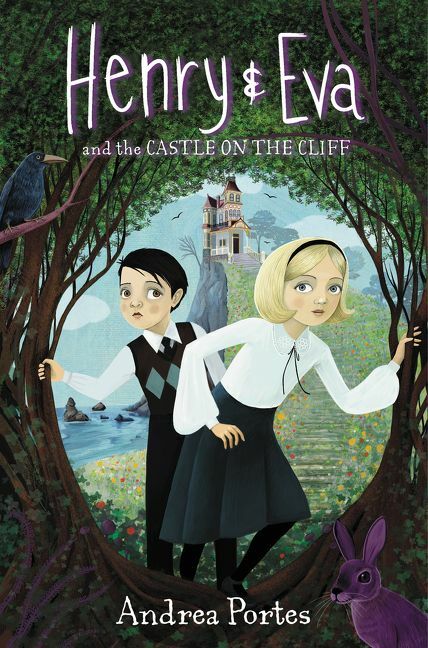 And the setting, based on Middleton’s hometown in Georgia, comes to life with evocative details and fully realized characters of all ages. 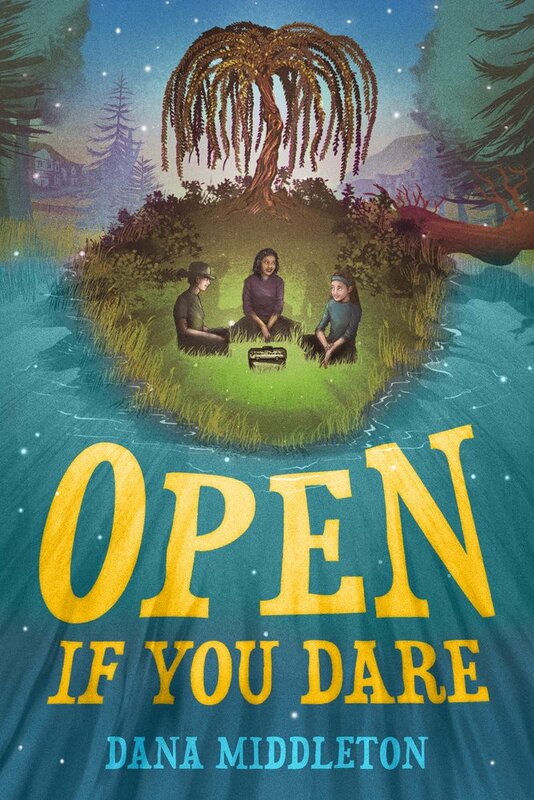 Ultimately, though, Open if You Dare is a story about friendship and where Middleton truly shines is in her depiction of the joys and complexities of building relationships with the people who understand us most in the world and the heartbreak of letting them go. I don’t think I’m giving anything away by telling you that, by the end of the book, the mystery of the dead girl is solved. But the mystery of what life will be like in middle school? Alone? Let’s just say Rose, Ally, and Birdie are ready to take it on. Let the adventure begin. Review by Colleen Paeff – Colleen lives in Los Angeles, California, where she writes fiction and nonfiction picture books. She hosts the monthly Picture Book Publisher Book Club and its companion blog, Picture Book Publishers 101. Look for her on Twitter @ColleenPaeff. For years, Lolly built Legos per the box’s instructions because they provided relief from the real world. When Lolly’s mother’s girlfriend begins giving him garbage bags full of Legos, it unleashes his imagination but their apartment isn’t big enough for his artistic endeavor. At his community center after-school program, Lolly finds the storage room a peaceful retreat where he can build alone, forgetting about everything else until he must share his space and blocks with a quiet girl the kids call Big Rose. When Rose does speak, she repeats comforting words to herself: “Your mama, your daddy—they were buried under the ground, but they’re stars now, girl, stars beneath our feet.” Her seemingly obscure statements affect Lolly. Their unlikely friendship evolves to include an understanding of shared pain. In the Harlem projects, death is too commonplace. Throughout the book, Lolly and his best friend, Vega, feel pressure to join a gang for protection; yet, that’s what led to Jermaine’s death. Lolly wavers between fear, anger, and acceptance of what seems to be his only path. The question of how to fit in pulls Vega away as they search for their own answers, boys on their way to becoming men. Moore’s book reveals our world’s imperfections and complications. Yet, hope shines through. We relate to Lolly’s conflicting emotions and understand his worries about the future. We all must decide how to best live our lives. 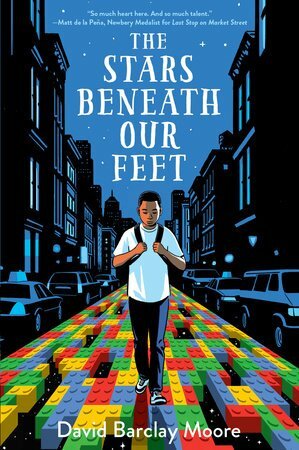 The Stars Beneath Our Feet shares a glimpse of one boy’s journey. I recently wrote to Mr. Townley to inquire if he would be agreeable to doing this interview with me. It all seemed something like tossing a penny into a wishing well, one of those moments in life when you shake hands with the universe on an agreement that you will both, ever so briefly say “Who knows? It could happen!” When Roderick Townley responded that he would do the interview, I was happy and completely astounded. I wondered what I would ask this “wizard of words?” This author’s writing always seems to have the charm of a fairy tale, the adventure of a contemporary fantasy novel and the depth of a poem. The Great Good Thing, The Blue Shoe, and The Door in the Forest are all among his literary treasures. Each of these works are well written, highly polished, deeply profound, and leave the reader the richer for having read them. Hilary Taber: What is your full name and where did you grow up? Roderick Townley: Grew up all around New York City: East Side, Greenwich Village, Brooklyn, Long Island. H.T. : What was your family like? Did they encourage your writing? 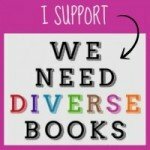 R.T.: They read, but were not “literary,” conventional in tastes, but encouraged my writing. My mom always thought I should write children’s books. A decade after her death, I published my first. H.T. : Who was the greatest inspiration to you in your young life? Is there any one person that stands out in particular? R.T.: I’ve had encouragers all along the way. Teachers especially, several of whom I saw as father figures after my own dad died. Mostly, though, it was what I read that inspired me. I thought of myself as a poet, and as a teenager was imitating Lawrence Ferlinghetti and (disastrously) Dylan Thomas. H.T. : Are there a few writers that you could name that have influenced your writing for children and teens? R.T.: Every writer I’ve ever read has influenced me. Bad writers have shown me what doesn’t work; good writers what does. What I look for is intensity (e.g.,James Agee), wild imagination (John Crowley), and depth (Melville, Rilke). You’ll notice that these are not children’s writers. But writing is writing, and in my books for young readers I am always trying for those qualities: intensity, imagination, depth. H.T. : I’ve read on your website that when you were a young boy you would write in a notebook, and that writing filled you with excitement that others didn’t seem to notice. What gave you that excitement? Do you still have that excitement now just as it was when you were young, or has it changed? R.T.: Back then, I was just excited by the story as it unfolded under my racing pencil. It was also exciting to realize that I was creating it–and could change it! What’s different now is that my stories are more dimensional, and I erase almost as much as I write. That makes the process slower and more painstaking. Less “fun” at times, but in the end more satisfying. H.T. : I’m a great admirer of your heroine Sylvie from your book The Great Good Thing. If you could close your eyes to enter a more dream-like state and “see” Sylvie, how would you describe what you see? R.T.: I see her in motion, a flash of wind-blown hair, quick eyes, dirty knees, disgracefully muddy blue leather shoes. Equally interesting to me is the way others have seen her. The German edition has her sitting in a tree on a sofa (! ); the Chinese edition depicts her in stylized woodcuts. And kids send me drawings of Sylvie that are wilder than anything I could have imagined. Every reader meets a different Sylvie, and that’s as it should be. H.T. : I read that a few of your books begin as a bedtime story to your wife Wyatt. How much of Wyatt do readers see in your heroines like Sylvie, Emily, or Sophia? R.T.: There’s some of Wyatt, a good deal of me, and a fair amount of our daughter Grace in Princess Sylvie. There’s a whole lot more of Wyatt in the two sequels, Into the Labyrinth and The Constellation of Sylvie, because I consciously wrote her in, as the character, Rosetta Stein. Wyatt, like Rosetta, teaches yoga, and both have the same restless hair–and restless spirit. But Wyatt’s presence in my books has to do with more than her resemblance to certain characters. She’s involved in the whole writing process, from the generation of plot ideas to the elimination of dangling modifiers. H.T. : It would seem unfair not to ask the same questions of you! How much of yourself do you see in your characters Daniel or Hap? Is there a character that you identify with most? R.T.: I am, in fact, all of my characters, boys, girls, villains, grandmothers. Even the poisonous jester, Pingree. You shouldn’t write any character that you can’t find within yourself. H.T. : A good deal of your books seem to be infused with poetry. This is not an easy question to answer perhaps, but how do you feel your background in poetry interacts with your writing for children and teens? H.T. : Madeline L’Engle made this statement, “You have to write the book that wants to be written. And if the book will be too difficult for grown-ups, then you write it for children.” Do you agree? If so, why do you think this is true? R.T.: It’s a striking statement, and reminds me of Philip Pullman, who said there are some themes so deep that they can only be addressed in a children’s book. That is true of a few extraordinary children’s books (Pullman’s among them), as well as of fairy tales and myths, which evoke archetypes of the unconscious. It’s not true, alas, of most “kid lit,” which tends to the cute, the shallow, and the vampiric. H.T. : If books had a genealogy just as people do, what books might be in your family tree of the books you have written? For example, often I have a Harry Potter fan that wants a book similar to the series. So I explain to them that there are such things as “book cousins.” Some books seem to be related to each other. They are somehow alike. What books might be considered cousins, mothers, fathers, aunts, uncles, grandmothers, grandfathers and so on of your writing for children and teens? R.T.: Publishers say they are looking for work that’s completely original. That is not true. Often they are looking for something very much like a well-known work–but with a twist. Let’s say, Harry Potter on ice skates. When I wrote The Great Good Thing, I didn’t think it was like anything I’d ever read. Reviewers later said it reminded them of Inkheart, by Cornelia Funke, although my book came out a year before hers. Basically, I try for stories that don’t remind me of other stories–why repeat what’s already been done? I leave it to others to discover the “cousins.” Those relatives do exist, but I don’t know about them beforehand and don’t concern myself about them later. Not my job. H.T. : Are you in the process of writing a new book? R.T.: I am. In the new novel, tentatively called The Black Rose, a woman disappears during a magic act, and her daughter, Cisley, is determined to find her and bring her back. The girl lives in a glass castle and walks her pet lobster on a golden leash along the seawall each morning. I’m open to suggestions about how it ends. H.T. : What do you hope for most that your readers will remember after reading your books? R.T.: Aside from the name of the author? I hope, of course, that they’ll think of the story with delight; but more important, that they’ll be left with a sense of their own inner world, the substratum of magic that is our deepest self. H.T. : Imagine that you found a book in the woods behind your house. This book is a mystery. It has a short beginning and an equally short ending already written. However, there is nothing written in the middle of the book. You’ve asked around and it seems to belong to no one. In fact, it appears to be very old and possibly entirely magical. Would you finish writing it or would you leave it alone? R.T.: Oh, of course I’d have a go at finishing it. The hardest parts of writing, for me, are finding the beginning and the end. If those are supplied, I’d be in writing heaven. H.T. : Imagine an enchantress who has a magical ring on each of her fingers. These rings have magical powers. What does each one do? R.T.: That’s ten powers, if she has ten fingers. (Does she? Does she have eleven?) I have no idea what her powers would be. If I had a ring, I’d hope it would magically do the dishes and put out the trash. H.T. : Imagine that the wind is a friend who visits you and Wyatt every so often. What does the wind look like or can you see the wind at all? What do you three talk about? R.T.: We live in Kansas, named after the Kanza Indians, called “People of the Wind.” Mostly the wind talks to us, rather than the other way around. It circles the house, enters and leaves our lungs, prowls through our poems. Its moods are unpredictable, one day furious (we live in “tornado alley”), the next day sweet natured. The thing I most admire is its fashion sense. Invisible itself, it dresses up in trees, smoke, flying debris, and the smell of violets. It’s why we live where we live. Many thanks to Roderick Townley from all of us at Good Reads With Ronna for his time, his talent, his insights and for bringing us “the magic that lies just beneath the surface of so-called ordinary life.” For more information about his wonderful books for children and teens, please visit www.rodericktownely.com. Click here now to read Hilary’s post about his novels. Why not tell us your ending for his new novel tentatively titled The Black Rose? We’d love to hear from you. Do you like fan art? Please click here to see some fab fan art. Find an artistic rendition of Princess Sylvie from The Great Good Thing with quotes from the books all along the edges. A huge tribute to Townley’s work by Shaylynn Rackers! Stop by the Flintridge Bookstore & Coffeehouse today to pick up your copy of these great books, buy gifts, enjoy their extensive selection of other great reads and relax over a great cup of coffee. 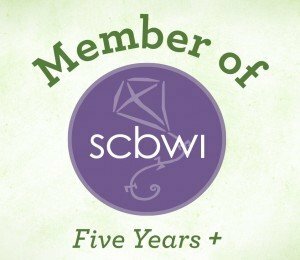 Check out the website at www.flintridgebooks.com to keep up-to-date with story times, author events and other exciting special events. And when you stop by, keep a lookout for Hilary peeking out from behind a novel. I once heard black author Rita Williams Garcia say that some of the fans who connected most closely to her characters were Asian. 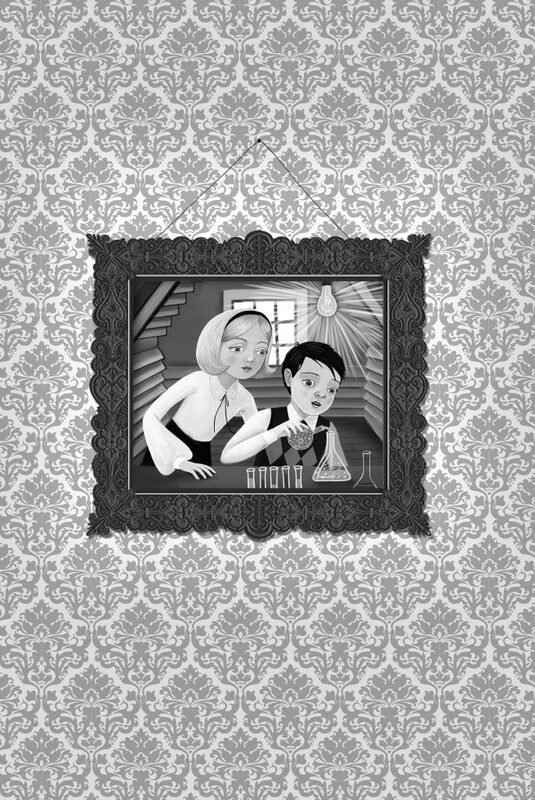 Apparently, the story Rita wrote held truth for many families. The authors of these books have all won major literary awards, but don’t save these books for Black History Month. These are terrific human stories that show that even though our experiences may be different, we all feel longing, heartbreak, injustice, and self-consciousness. These books can all prompt great discussions about how the characters feel, what they have to deal with and what choices they make. I especially recommend them for book reports or Mother/Daughter book clubs.